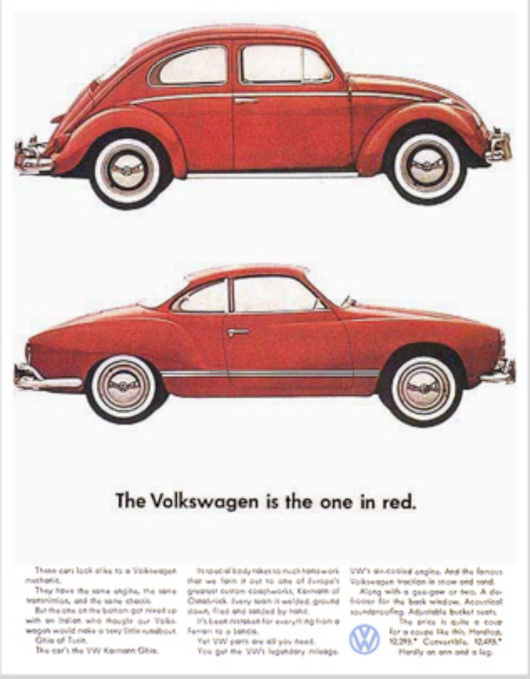 In 1959, an advertising campaign launched that helped sell a German car in a Jewish New York town. Not only did the campaign sell a few cars, but it also skyrocketed the company into being one of the most well-known and loved car brands in the industry. 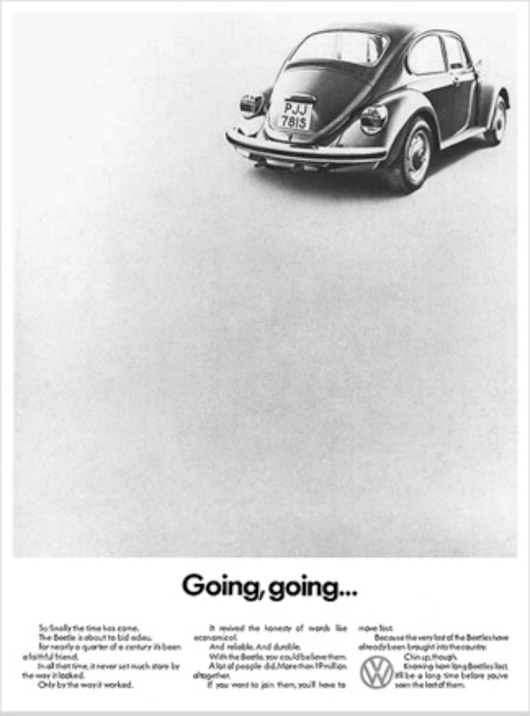 The car—Volkswagen, the campaign—Think Small. First and foremost, the premise of the campaign was extremely bold. 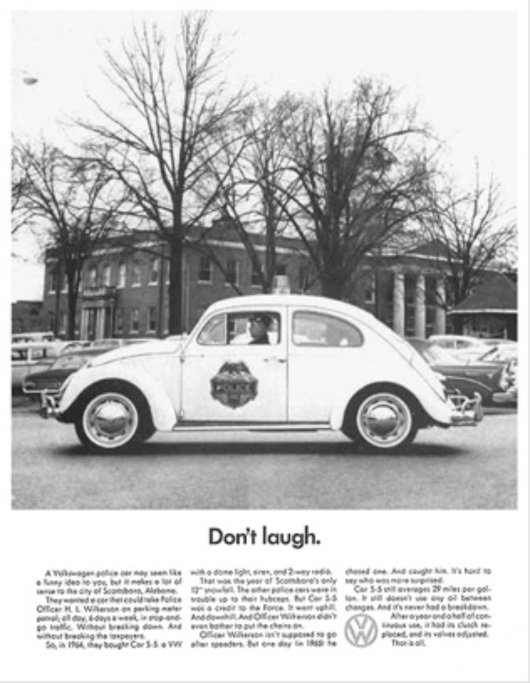 The agency, Doyle Dane Bernbach (DBB), took a car that was designed specifically for Adolph Hitler, and sold it to post-war Americans through radically designed advertisements. Up until this point, car ads went big. 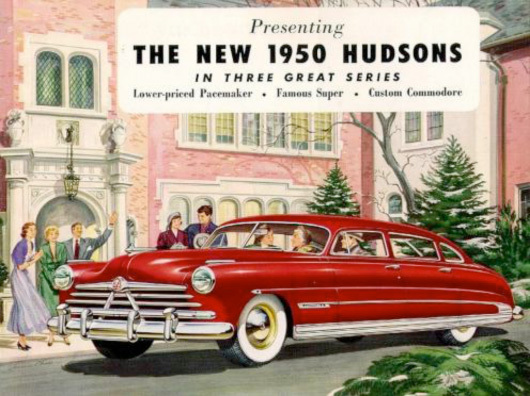 They were luxurious illustrations and photographs, with text touting how their vehicle is a one-stop shop for the American dream. They talked luxury, danger and made near outrageous claims. Essentially, like most products, it told you that if you drove their car, it would make you rich, popular, beautiful, and so forth. They told you to think big. Volkswagen, on the other hand, took a different route. A realistic route. In essence, it told you to “think small”, a nod to the small size of their cars, but also a nod to thinking realistically. The campaign went on for years, finally solidifying VW’s place in the heart of America. See more of their historic ads below. Of course, for the business and advertising professional, the message is simple: honesty is effective. 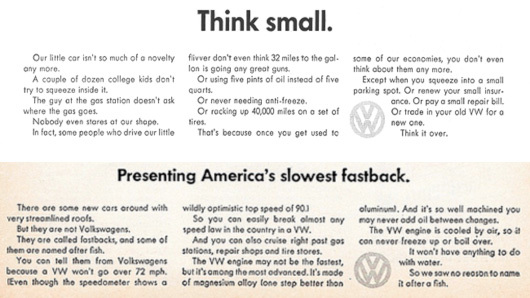 Even in 1959, people were tired of outrageous miracle claims made by companies—they saw Volkswagen speaking in a playful and honest manner—and it made an impact. However, I think this campaign also speaks volumes to young professionals and college students. Plenty of young people on the job hunt put on a big show. They have their own websites, their own business cards, and a huge social media presence—but not much to actually tout (just yet). Employers see that their websites don’t mention much, and their business cards don’t list any job title, and the social media presence is great, but how’s it any different than the others? The effort is great, but the substance is lacking. 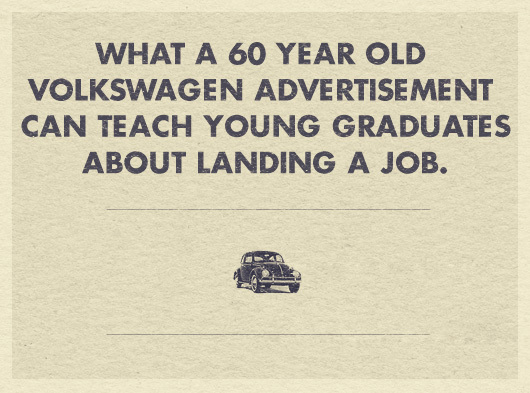 The Volkswagen campaign teaches us how to sell ourselves properly. It teaches us to be realistic in our skill set, but still ambitious of what we can do and our true potential. As a young professional, it truly shows us that although we may start off small—there is nothing wrong with that. You may be small (at this point), but hone in your skill set, flaunt what you got, and dream big. Tyler is a writer and advertising professional based out of Baton Rouge, LA. Follow him on Twitter @wtylerallen. I’m still pounding pavement and so far I found a job that pays less than I made in high school. It takes time and perseverance to accomplish anything worth doing and this won’t stop me or others like me from pursuing what we’re capable of, but it’s still discouraging to work so hard through school and accumulate so much debt only to struggle finding jobs that pay a decent wage. Thanks Tyler for the solid advice, I’ll keep your perspective in mind for my next interview. 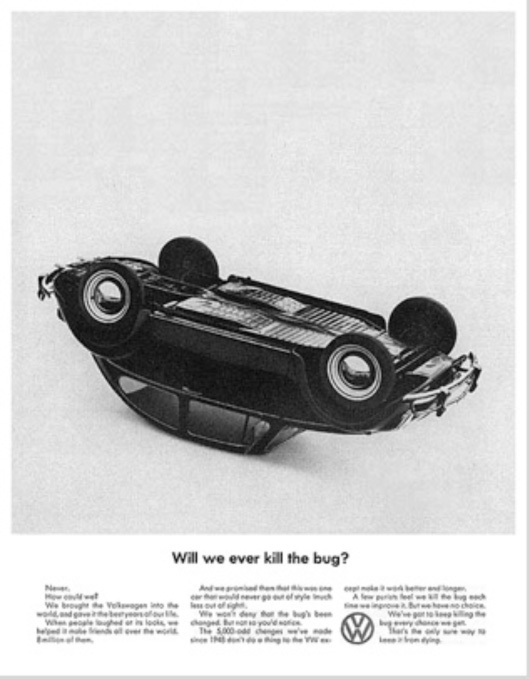 DBB’s VW campaigns are legendary. 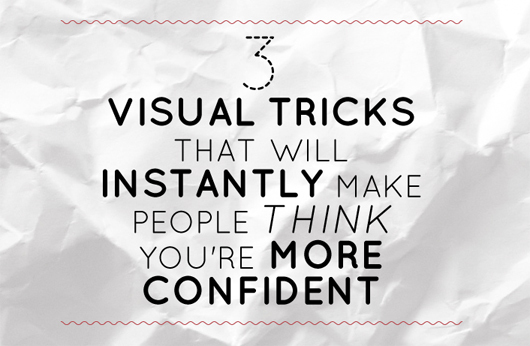 They are often cited for their groundbreaking use of “white space” and minimalism. Their style is still being copied today, most prominently with Apple. Besides honesty, these ads also effectively pointed out their unique selling points and a juxtaposition to how cars were being marketed at the time. Key point – different isn’t bad, in many times it’s better.